The news in regions of the USA and Canada is about “tick season” and it appears to be getting worse. I can believe it, having lived both a long time and in various latitudes. Ticks-and Lyme Disease-have increasingly become serious problems for dog owners and the general public. Lyme and other tick-borne diseases like Rocky Mountain spotted fever accounted for 75% of what the CDC calls “vector-borne disease cases.” Lyme disease is a bacterial infection resulting from a bite from an infected blacklegged tick. Symptoms resemble those of the flu including fever, chills, headache, fatigue, muscle and joint aches, and a rash that’s sometimes shaped like a bull’s eye. Because of the flu-like symptoms, it is often undiagnosed until the condition gets much worse and treatments for other disorders prove ineffective. Only blacklegged ticks (and not all of them) carry the Lyme Disease bacteria so check your own state. In some states the incidence has more than tripled. 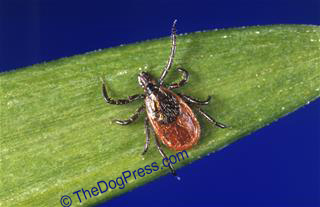 It boils down to this: all ticks are irritating and certain breeds of ticks bring serious health risks. 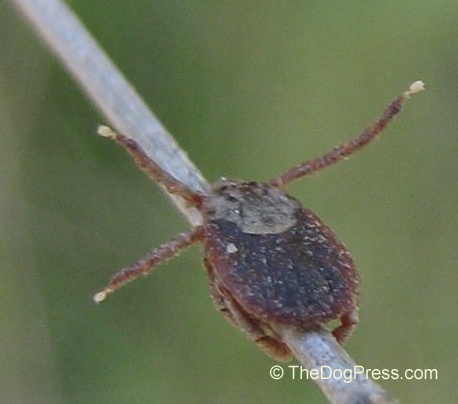 Some ticks take a long time to find and they feed on blood. 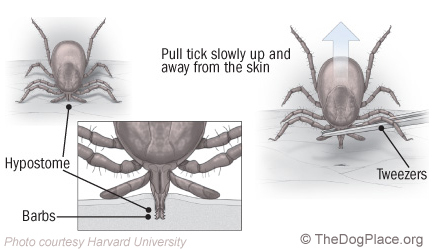 Ticks deposit germs and virus particles while they do their little vampire-thing. If you can remove ticks in the first day or two, you stand a good chance of avoiding enough antigen (“bad stuff”) to prevent disease. Daily inspection and removal is imperative, regardless of what preventive measures you are also taking. I have found the best tool to pick off ticks is a tweezers with a very sharp point. You need this in case the pincers or head stays imbedded in the skin when you pull the body off. Otherwise, you’ll get worse inflammation and related problems. Grab the rascals as close to their biting parts as you can. You undoubtedly will miss a tick or two even if you examine daily and have a small short-haired dog. So, a couple times during the tick season, you might also consider increasing the amount of ivermectin you administer for intestinal-and heart-worm prevention. It does a pretty good job killing or inhibiting ticks, as well as the microfilaria. Do a computer search or go to www.thedogplace.org/parasites/ivermectin-wormer.asp for my articles on ivermectin. Make sure you kill the ticks before you put them in the garbage or toilet bowl… pierce them with the tweezers because they can still survive if you only pull some legs off. A woman in Nova Scotia is trying to get government approval to market an anti-tick spray. Her mix “AtlanTick” is awaiting approval by Canada’s Pest Management Regulatory Agency. Canada and western Europe are famous for pushing “herbal” approaches and trying to avoid synthetic (man-made) chemical ones that might be more effective but are disliked by some-especially neo-hippie generations. The Canadian entrepreneur and another researcher (at Acadia University) claim their spray repelled about 75% of the tested ticks, compared to DEET (diethyltoluamide), which reportedly repels 100%. She says she wanted to find an alternative to putting DEET or other “chemicals” on her son’s skin, ignoring the fact that her “natural” ingredients are also “chemicals”! (An aside: as a chemist, I feel like shaking my head when people misuse or redefine words such as these.) Anyway, she was driven to her research because her eldest son continues to live with the symptoms of Lyme disease, since antibiotics were not completely effective in his case. Avoidance tips usually tell you to use repellents, wear light-colored, long-sleeved clothing, and tuck pant legs into socks. Cover up, even in hot weather. Wear a hat and something around your neck to cover up even more skin; inspect your hair when you get back from your hike or outdoor activity. It’s good to suggest people keep their grass cut short and not wander through tall weeds but I’ve known ticks to fall off tree and shrub branches onto the head and upper parts of bodies, both canine and human. In tick season, check your dog’s coat and skin, your clothing, and your skin (naked, before a mirror), because ticks will embed in your skin in spite of precautions. Use of insect repellants may be good advice; CDC recommends either DEET, icaridin (trade names include Bayrepel and Saltidin), or InsectRepellant3535 (ethyl butylacetylaminopropionate) against ticks and at higher concentrations as IR3535 is solely a repellent, it has no killing action. Doctors advise not using repellants on infants. On myself, I prefer minimal use of repellants and maximal use of washing and inspecting, but it’s up to you. Besides using a mirror and a spouse or parent for a body check, inspect your clothing before hanging them up again. And check your dog at least twice a day if you live “close to nature”.